Family Legacy Video notches two more awards. Family Legacy video, Inc. continued its winning ways this year, garnering two more awards for a recent video biography entitled “An Aloha Spirit,” featuring a client from Hawaii. On April 26, the Academy of Interactive and Visual Arts announced that “An Aloha Spirit” had earned a Communicator Award of Distinction in the History/Biography video category. With over six-thousand entries received from across the US and around the world, the Communicator Awards is one of the largest and most competitive awards program honoring the creative excellence of communications professionals. On May 1st, “An Aloha Spirit” received a Gold Award from the Hermes Creative Awards, administered and judged by the Association of Marketing and Communication Professionals. This year’s Hermes competition also saw over six-thousand entries from throughout the United States, Canada and several other countries. Entries came from corporate marketing and communication departments, advertising agencies, PR firms and video production companies. 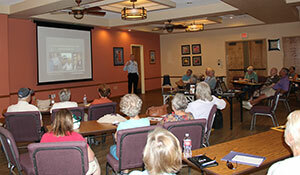 Talking legacy video in Tucson. On April 21, Family Legacy Video’s president, Steve Pender, was the guest speaker at the monthly meeting of the Sunflower Genealogy Society. Steve spent an hour with the group, sharing his story, extolling the benefits of video biographies and, most importantly, showing clips from a number of the legacy videos he’s produced over the years. Steve’s “show and tell” left the audience informed and inspired – and opened their eyes to the possibilities of preserving, celebrating and sharing their stories on video. Storing digital files like photos and videos on computer servers outside the home (know collectively as “the cloud”) has become a popular thing to do. More and more sites allowing families to collaborate on family histories by contributing stories, photos, and audio and video clips are popping up to serve a growing market. BUT, entrusting your information to a remote site can have a downside. Before you do that, read this article. Then, if you do choose to go to “the cloud,” do your best to make sure the company you sign on with is reputable and that it offers a way to back up and download your precious family assets.